We’d love your help. 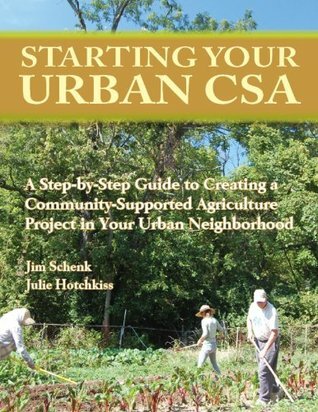 Let us know what’s wrong with this preview of Starting Your Urban CSA by Jim Schenk. The Enright Ridge CSA, a mission of the Enright Ridge Urban EcoVillage in the Price Hill neighborhood of Cincinnati, Ohio, is a co-operative community-supported agriculture project. Volunteers came together to make the project a reality; they hired an experienced farmer who provided guidance as they learned about high-production farming, successive plantings, and high-volu The Enright Ridge CSA, a mission of the Enright Ridge Urban EcoVillage in the Price Hill neighborhood of Cincinnati, Ohio, is a co-operative community-supported agriculture project. Volunteers came together to make the project a reality; they hired an experienced farmer who provided guidance as they learned about high-production farming, successive plantings, and high-volume production techniques. By its second year, the CSA was providing produce for more than 100 people for six months of the year on less than an acre of land. CSA members decided to share what they had learned about urban co-op farming, with the belief that other neighborhoods can learn from the Enright CSA experience—both from successes and missteps. With this book, author Jim Schenk’s dream may well become a reality, as he inspires every neighborhood across the country and around the world to support flourishing urban farms. It’s time to learn how to feed ourselves again, and the information in this book encourages you to give it a try. To ask other readers questions about Starting Your Urban CSA, please sign up.